Heru-em-Akhut (Her-em-Akhet) is a Khemetan term that roughly translates to Heru in the Horizon. It is a Monument which depicts the head of an Afu-Ra-Kan [Afrikan] atop the body of a lion, known today as the ‘Great Sphinx of Giza’. Heru-em-Akhut was later used as the model for the hellenic “Harmakhus”. 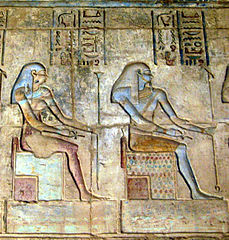 Throughout history, people have been perplexed by the majestic presence of Heru-em-Akhut. At over 66-feet high, 20-feet wide and 241-feet long, Heru-em-Akhut stands as the largest monolithic structure in the world. Its dimensions are as massive as its builders’ achievement–an achievement so great that, when later witnessed by european explorers, they concluded that a reality of it being built by Humans could not be possible. The gods which personify the sun and sky stand apart in their essential idea from those already described, although they were largely mixed and combined with other classes of gods. So much did this mixture pervade all the later views that some writers have seen nothing but varying forms of sun-worship in Egyptian religion. It will have been noticed however in the previous chapters what a large body of theology was entirely apart from the sun-worship, while here we treat the latter as separate from the other elements with which it was more or less combined.